250 pages | 40 B/W Illus. The strengthening of relations between Poland and Ukraine over the last 25 years is one of the most positive examples of transformations in bilateral relations in Central and Eastern Europe. In spite of the complex and difficult historical heritage dominated by the events of the World War II and the first few years that followed, after the fall of Communism in Poland and Ukraine, bilateral institutional cooperation was successfully undertaken, and mutual social contacts were recreated. The issue of Polish-Ukrainian relations at the international and trans-border level gained particular importance at the moment of expansion of the European Union to the east, and announcement of the assumptions of the European Neighbourhood Policy in 2004. Since then, relations have continued to thrive and provide a blueprint for cross-border relations in other parts of the EU. 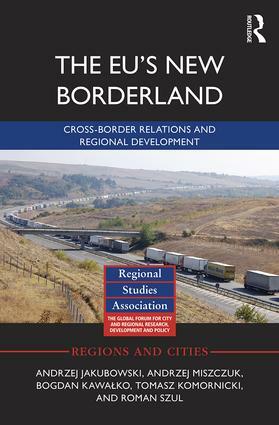 In this book the authors examine the issue of cooperation and cross-border relations on the new external border of the EU. The book’s primary objective is to present the way in which the Polish and Ukrainian parties develop the bilateral cooperation, adapting to the changing geopolitical conditions, and responding to the related challenges. The chapters offer a comprehensive diagnosis of the conditions determining the current and future state of Polish-Ukrainian cross-border cooperation and describe the area as a social, economic, and political space. The EU’s New Borderland will be of interest to university students of international relations, geography, economy, or history as well as those willing to expand their knowledge in the scope of regional geography, European integration, cross-border cooperation, and international relations. Andrzej Jakubowski is an Assistant Professor at the Faculty of Earth Sciences and Spatial Management, Maria Curie-Sklodowska University in Lublin, Poland. Andrzej Miszczuk is a Professor at the Centre for European Regional and Local Studies – EUROREG, University of Warsaw, Poland. Bogdan Kawalko is head of the Regional Policy Department in the Marshall Office of the Lublin Voivodeship, Poland. Tomasz Komornicki is a Professor at the Faculty of Earth Sciences and Spatial Management, Maria Curie-Sklodowska University in Lublin and the Stanislaw Leszczycki Institute of Geography and Spatial Organization, Polish Academy of Sciences, Poland. Roman Szul is a Professor at the Centre for European Regional and Local Studies – EUROREG, University of Warsaw, Poland.